Superintendent of Schools Michelle Brantner introduces the latest photo slideshow showing progress in the Marcellus High School renovations. Check it out! In her latest capital project video, Superintendent of Schools Michelle Brantner lets the photos do the talking, as she introduces a slideshow of images that show newly renovated rooms filling up with desks, tables, bookshelves and lockers. Right before the holiday break, Superintendent of Schools Michelle Brantner recorded her latest capital project progress video. Check it out! Marcellus residents will have an opportunity tomorrow (Tuesday, Dec. 11, 2018) to vote on a proposed capital project. Polls will be open from noon to 9 p.m. in Groeling Auditorium in the Mustang Hill (high school) building. If approved, the project would address critical maintenance issues affecting the teaching and learning environment for both students and staff. The three major components of this project are: dealing with drainage issues in the basement of Driver Middle School; replacing an aging and failing heating system at the middle school; and resurfacing the track and turf and retrofitting the lights with LED at the high school athletic complex. There is no additional tax increase associated with the proposed project. District officials estimate 80 percent of the project would be paid for with state building aid. The remaining local share would be financed through district debt replacement, meaning there would be zero additional tax impact for district residents. In 2021, Marcellus anticipates paying off debt incurred from a 2005 capital project. The district is proposing to: replace the 30-year-oil steam boilers in DMS with new, high-efficiency gas boilers and replace all the original wooden sash windows with energy-efficient options equipped with screens; repair drainage issues that lead to basement flooding after heavy rainfall at the middle school; and resurface the track and turf field at the high school athletic stadium, both at the end of their useful life, and retrofit the existing lighting there to LED to improve energy efficiency and reduce light pollution affecting campus neighbors. Construction would take place during the summers of 2020 and 2021. For more information about the proposed project, which residents will consider during a referendum vote on Tuesday, Dec. 11, 2018, check out the videos and other information on the Capital Project web page. For residents who are unable to attend the public hearing scheduled for Monday, Dec. 3, on the proposed 2020 capital project, Marcellus Superintendent of Schools Michelle Brantner has prepared a video in which she discusses, slide by slide, the PowerPoint presentation that she will deliver during the hearing. REMINDER: There will be a public vote on the proposed project on Tuesday, Dec. 11, in Groeling Auditorium. 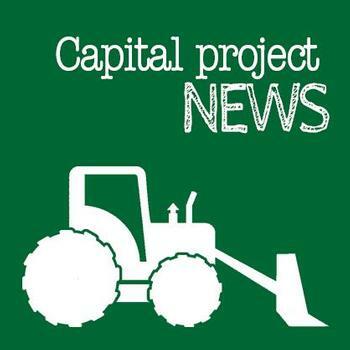 For more information and videos about the project, please check out the Capital Project web page. Nov. 7, 2018 -- In her newest video, Superintendent of Schools Michelle Brantner narrates a slideshow of photos showing the progress that's been made in the capital improvement project underway in the high school building. Check it out! At their regular board meeting on Oct. 1, members of the Marcellus Board of Education adopted a resolution to schedule a voter referendum on a proposed capital improvement project for Dec. 11, 2018. On Tuesday, Dec. 11, 2018, Marcellus Central School District residents will vote on a proposed $9.9 million capital improvement project. If approved, the project would address critical maintenance issues affecting the teaching and learning environment for both students and staff. The three major components of this project are: dealing with drainage issues in the basement of Driver Middle School; replacing an aging and failing heating system at the middle school; and resurfacing the track and turf at the high school athletic complex. 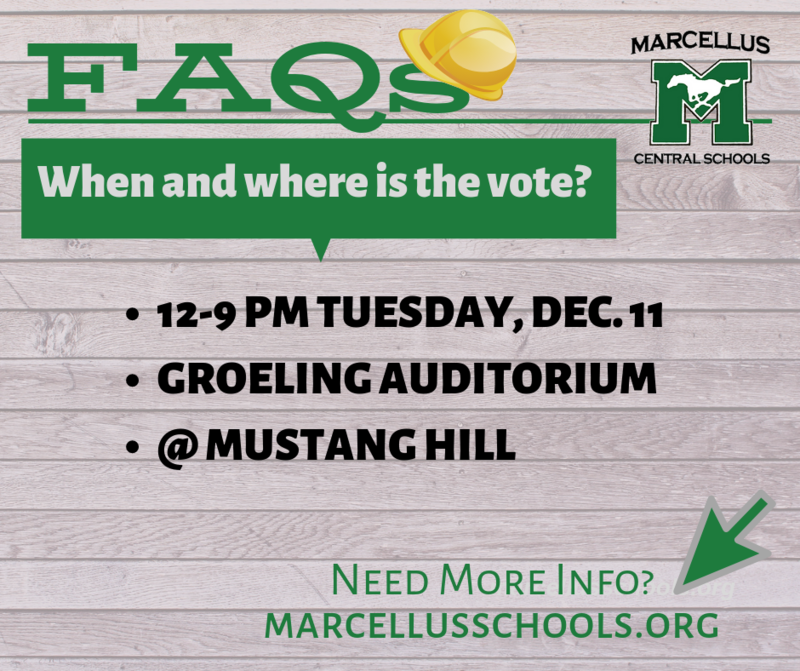 A public hearing on the project will be held at 6 p.m. Monday, Dec. 3, 2018, and the voter referendum will take place between noon and 9 p.m. Tuesday, Dec. 11, both in the auditorium of Marcellus High School, located at 1 Mustang Hill. In a new video, Marcellus Superintendent of Schools Michelle L. Brantner discusses the critical infrastructure deficiencies that are prompting the school district to propose another capital improvement project for 2020. The Board of Education is expected to adopt a resolution at Monday's regular meeting (10/1) to schedule a voter referendum on the project for Dec. 11, 2018. Superintendent of Schools Michelle Brantner provides a new update on the work recently completed at K.C. Heffernan Elementary and the construction continuing at Marcellus High School. VIDEO: What's been happening over the summer with the project? Superintendent of Schools Michelle L. Brantner is back on camera to provide another update on the capital project progress that's been made at the high school and KCH Elementary School over the summer months. Check out Superintendent of Schools Michelle Brantner's newest update about the district's ongoing capital improvement project at the high school. Check out the latest video update about the ongoing capital improvement project with Superintendent of Schools Michelle L. Brantner. In her latest video update about the district's capital improvement project, Superintendent of Schools Michelle Brantner talks about the demolition that's underway in the high school's first floor main corridor and second floor instructional spaces. In her newest video, Marcellus Superintendent of Schools Michelle Brantner introduces a photo slideshow of the latest progress in Phase One of the capital improvement project, and provides an update on the next project in the pipeline. Check out a slideshow highlighting the latest progress on the capital project at Marcellus High School. In the video below, Superintendent of Schools Michelle Brantner shares some behind-the-scenes footage of the work that's underway in the construction zone at Marcellus High School. In the video below, Superintendent of Schools Michelle L. Brantner introduces a slideshow of photos depicting recent work on the high school choral room addition and science classroom and boiler room updates. In her latest update on the capital improvement project, Superintendent of Schools Michelle Brantner describes the removal and replacement of a concrete slab beneath some classrooms, progress on the new choral room addition and a look ahead to another relocation of some students and staff early next year. In a new video, Marcellus Superintendent of Schools Michelle Brantner reports on all the progress that's been made with the district's capital improvement project over the summer months. Within minutes of students and teachers starting their summer break in late June, movers and contractors descended on campus to begin the initial stages of the capital project and the related relocation of staff, offices, classrooms and lots and lots of boxes. In her latest video, Superintendent of Schools Michelle Brantner offers the latest update on the work already underway and a peek at what's to come. Although students and teachers won't be relocating for the capital project until they return in September, many employees who work year-round on campus have already been shifting to new locations. As Superintendent of Schools Michelle Brantner promised in her most recent video, here is a chart indicating where those folks are now situated. In the video below, Marcellus Superintendent of Schools Michelle Brantner describes the work already underway for the district's capital improvement project, which kicks into high gear this summer. During the Board of Education meeting on Monday, March 20, Superintendent of Schools Michelle Brantner explained her proposal for relocating students and staff during the upcoming capital improvement project scheduled to begin later this spring. Last year, the district was preparing to relocate students in ninth and 10th grades to DMS, but the plan was never finalized. In order to accommodate splitting the high school, students would need to shuttle between buildings throughout the day to access all of their classes. Adding extra time between class periods to accommodate the shuttling would delay dismissal and eliminate the possibility for an activity and extra help period after school. In addition, buses would not be able to make it back to the campus in time for the dismissal of students in grades K-6. As a result, a second option was investigated and ultimately chosen as the most viable option over the 23-month period of construction. Over the next few weeks, the administrative team will be busy finalizing details in preparation for moving at the end of June. Plans are underway for the district’s upcoming capital project, with groundbreaking set for early June. Because so much of the high school building requires renovation, the district must relocate students during the 23-month construction period. As many of you know, a scenario was in the works last year, before bids came in over budget and the project was put on hold. Once the district received approval to go forward with the work, administration began to re-examine the original relocation plan and discovered serious issues with the feasibility of implementing it. That led to a second relocation plan option. Over the past several weeks, Superintendent of Schools Michelle Brantner has been working with the administrative team, as well as a steering committee made up of staff, parents and students, to examine both options. The goal has been to gather enough information to help district leaders make an informed decision about the best option moving forward. Prior to beginning the examination process, the Board of Education also re-examined priorities for the move. The top priority remains keeping all students on one campus. Option 1: Juniors and seniors remain at the high school; fourth-graders move to KCH; all other students are located at DMS. In an effort to help students and parents better understand both options, we have prepared the following Q & A, highlighting some of the most frequently asked questions. In addition, we will hold a community forum at 6 p.m. March 8 in the high school auditorium to review the plans and also answer any questions people still might have. A final recommendation will be made to the Board of Education at its March 20 meeting. Q: What are the problems with Option 1? Juniors and seniors were looking forward to staying at the high school. A: With the high school split, many students would have to shuttle between DMS and the high school for classes. Hardest hit would be accelerated students and students in music programs. Shuttling trials were done, and we struggled to make the transfer happen within 8 minutes. Adding 8 minutes between classes would create a lot of dead time during the day for all students in grades 7-12, as they will all be on the same schedule. In addition, expanding the time between classes would extend the school day. Students in grades 7-12 would not be released until approximately 2:45 p.m., eliminating the opportunity to have activity and extra help periods. In addition, releasing 7-12 students at 2:45 p.m. makes it impossible for district buses to return in time to pick up K-6 students at 3:20 p.m.
Q: Where will the all-school show be held while the high school is under construction? A: The all-school show will still take place at the high school because the auditorium is not being affected in the construction. Q: Where will high school sports events take place during the construction? A: High school athletes will continue to have practices and contests in their regular locations at the high school. In the summer and fall of 2018, there will be major renovations occurring in the high school locker rooms, and we will need to relocate changing areas for fall athletes at that time. We have targeted a completion date of mid-October 2018 for the locker rooms to ensure winter sports will not be disrupted. In addition, students in the high school building during the fall of 2018 will either need alternate PE changing facilities or will be doing activities at the beginning of that school year that can be done without changing required. Q: Will fourth-grade students be part of KCH or part of DMS? A: It makes sense for this two-year period for fourth-graders to become part of KCH. We will still have beginning band rehearse before school at DMS, because that building has a more appropriate facility for this use. Q: Who will be principal if seventh- and eighth-graders move to SHS? A: Both Ms.Janet O’Mara and Mrs. Jean Sharlow will continue to be the principal and assistant principal for DMS, respectively. Under scenario 2, they will split their time between the high school and DMS. Q: What cell phone policy will be in effect if high school students go to DMS? A: High school students will still enjoy the same privileges they currently have as students at the high school, regardless of the building they occupy. Q: What teachers will students have? A: Teachers will move with their current grades. Therefore, high school students will still have high school teachers and DMS students will still have DMS teachers. Q: Will there still be intramurals? A: Under option 2, it is our hope that we will still be able to run intramurals at both the high school and DMS. We are currently working on some scheduling issues at DMS and, once that is complete, we will have a more definitive answer. Under option 1, with the elimination of the activity period, the continuation of intramurals would be challenging, as the gym space is needed at 3 p.m. for athletic team practices. Q: Under option 2, where will SHS students who drive park? A: While we are still working out parking plans for the district, we believe we will be creating a temporary lot between the high school and KCH. We would like to use that lot for student parking because it is closer to DMS and does not necessitate students crossing the road to get to the building. Q: Will 9-12 students have the same lunch foods they now have at the high school? A: In either scenario, our cafeteria staff will be able to continue with the new lunch program for high school students. Q: Are there concerns regarding commingling of fifth- and sixth-grade students with students in grades 9-12? A: We currently are able to successfully separate our younger students at DMS from our seventh- and eighth-graders. We see no issue with doing the same when high school students are relocated to DMS under either scenario. It is our hope that we will have new opportunities for mentoring and classroom buddies as a result f this relocation in either scenario. Q: Will graduation still occur in the high school auditorium? A: Yes. Under either scenario, we will still hold our graduation ceremony in the high school auditorium. Q: Will student support services (guidance, nursing, social services) move with the students? A: Yes. We do believe that Mrs. Lorraine Reynolds will also spend some time at KCH to assist in supporting the needs of our fourth-graders. Q: How will elective programs like art and music be affected? A: The capital project will not impact the ability of the senior high school to offer courses. However, there are natural events that occur in the scheduling process such as course conflicts and low enrollment that will inform the decision to run certain courses. Q: Will school resource officers still be present in all buildings? A: Yes, We will still have resource officers in each of the three buildings. If you have additional questions that are not addressed here, please feel free to send them to Superintendent Brantner via email at mbrantner@marcellusschools.org. District administrators are in the midst of finalizing plans for the relocation of students during the capital improvement project over the next two school years. 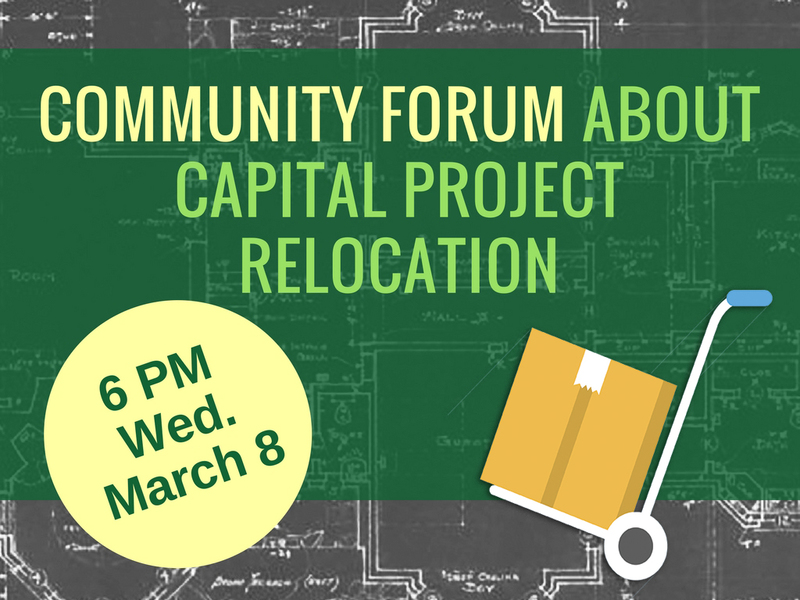 Please join them for a community forum at 6 p.m. Wednesday, March 8, in the Marcellus High School Auditorium, where they’ll discuss the status of relocation plans and answer questions from the audience. Madeline Mahoney, a Marcellus High School junior who also serves as student representative on the district Board of Education, recently sat down with Superintendent of Schools Michelle L. Brantner, to share some concerns her schoolmates have about the relocation that will be required for the upcoming capital project. Watch their exchange in the video below. During the Board of Education's regular meeting on Jan. 23, Superintendent of Schools Michelle Brantner reviewed the two options the district is now considering for the temporary relocation of students and staff during the capital project renovations at the high school in 2017-18 and 2018-19. She also presented a proposed timeline for discussing and deciding on a plan (see at bottom of page). In the video below, Mrs. Brantner recaps the BOE presentation. In the video below, Superintendent of Schools Michelle L. Brantner provides a progress report on the Marcellus capital improvement project. 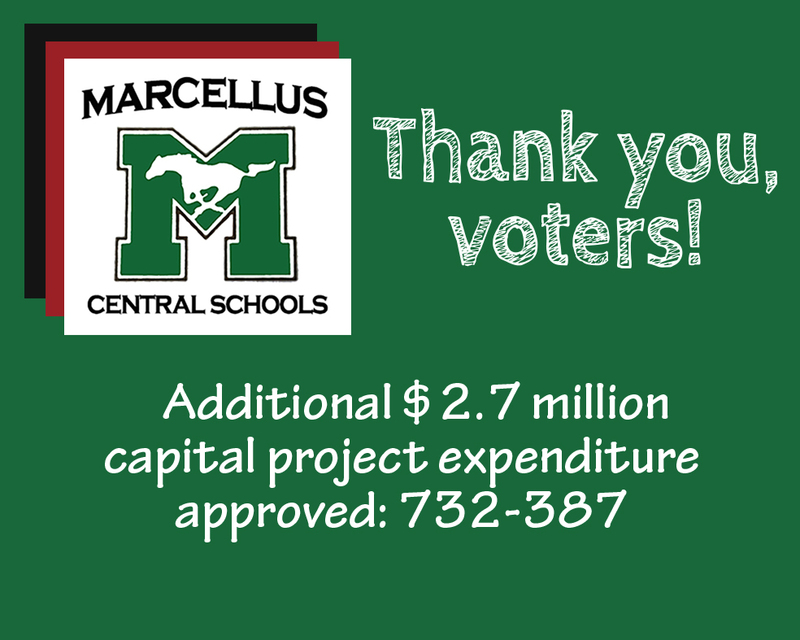 On Tuesday, Nov. 15, Marcellus Central School District residents voted to permit the district to spend additional funds to complete the capital project approved by voters in March 2015. The community’s approval authorizes the school district to utilize money currently available in reserves to cover the cost of the local share of the increase. Marcellus residents approved the measure 732 yes votes to 387 no votes. Marcellus residents approved a capital project expenditure of $14,844,078 on March 10, 2015. After construction bids for the originally scoped project came in 25 percent over budget in May 2016, however, the Board of Education determined an additional $2,689,404 would be needed. The BOE rejected the bids, replaced the lead architect on the project and drafted a revised plan that trims some scope and costs but retains the essence of the original project: to upgrade the high school's instructional spaces for 21st century learning. District officials said they expect the increase to have zero additional impact on the local tax levy, because state building aid will cover 82.3 percent of the cost and the district has the remaining 17.7 percent (approximately $520,292) available in reserve funds. begin construction in June 2017 and complete it in early 2019. 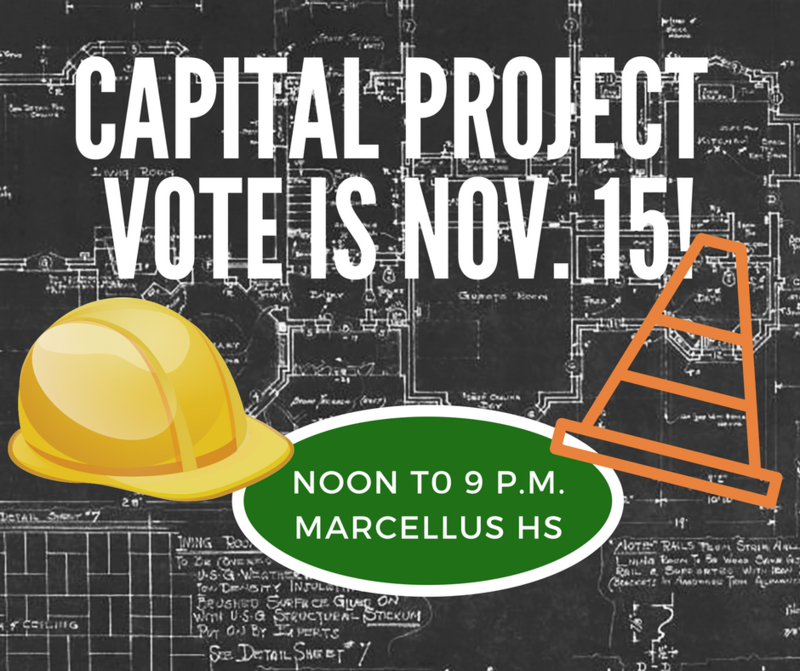 Next week, Marcellus Central School District residents will have an opportunity to vote on a referendum that asks if the district should be permitted to spend additional funds to complete the capital project approved by voters in March 2015. The proposal would authorize the district to utilize money that is currently available in reserves to cover the cost of the local share of the increase. 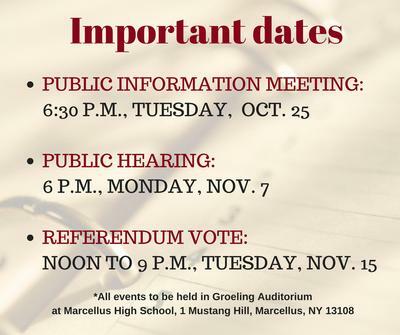 Polls are open noon to 9 p.m. Nov. 15 in Groeling Auditorium at Marcellus High School, 1 Mustang Hill, Marcellus, New York 13108.
cover 82.3 percent of the cost and the district has the remaining 17.7 percent (approximately $520,292) available in reserve funds. begin construction no sooner than June 2018. For more information about the capital project, including articles, slideshows and videos, check out the Capital Project News page on the district website. One week from today, Marcellus Central School District residents will go to the polls to vote on a referendum that asks if they will allow the school district to increase the total amount of money it will spend on the capital improvement project. State law requires such a referendum to include specific, detailed language. To assist voters in understanding what they will see on the ballot Nov. 15, Superintendent of Schools Michelle L. Brantner explains the language in the video below. Polls are open noon to 9 p.m. Nov. 15 in Groeling Auditorium, Marcellus High School. Please vote! Don't forget to vote Nov. 15! With all the changes in recent months, have you lost track of the scope of work included in the district capital project? Superintendent Michelle Brantner breaks it down in a two-part video series. Here's the first video, which covers work planned for instructional areas. Stay tuned for Part Two in coming days. The community vote is Nov. 15. About 20 residents attended a community meeting Oct. 25 to listen to Superintendent of Schools Michelle L. Brantner describe and answer questions about the Nov. 15 referendum, in which voters will consider authorizing the district to spend an additional $2,689,404 on improvements planned for Marcellus High School. The additional expenditure will have zero additional impact on the local tax levy, Ms. Brantner explained, because state building aid will cover 82.3 percent ot the cost and the district has the remaining 17.7 percent (approximately $520,000) available in reserve funds. During the meeting, Ms. Brantner walked through the four-year history of the project, which so far has included: a voter referendum in 2014, in which residents rejected a proposed $18 million project; another referendum in March 2015, in which voters approved a scaled-down project with a $14.8 million price tag; construction bids that came in 25 percent over budget in May 2016, due to a confluence of factors that included too-low estimates from the architect and delayed state approval of building plans; and now a revised project that trims some scope and costs but retains the original "essence" of a project designed to upgrade the high school's instructional spaces for 21st century learning, Ms. Brantner said. Click here to view, print or download a PDF of the presentation. A public hearing on the referendum will be held 6 p.m. Monday, Nov. 7, at the high school. The vote will be noon to 9 p.m. Nov. 15. Superintendent Brantner discusses the items that were trimmed from the project in an effort to cut costs to a level that could be funded with existing monies. Check back next week for a two part series on the scope of the project. In a new video, Superintendent of Schools Michelle L. Brantner explains why the Board of Education voted last week to schedule a voter referendum on the school district's capital project on Nov. 15. The Marcellus Board of Education voted Sept. 19 to hold a public vote to determine if district residents can support an additional expenditure of $2,689,404 for the planned capital improvement project that was postponed last spring. The vote will take place from noon to 9 p.m. Nov. 15, 2016. Set to start this past June, the project had to be halted in May after construction bids came back higher than the $14.8 million approved by voters in March 2015. 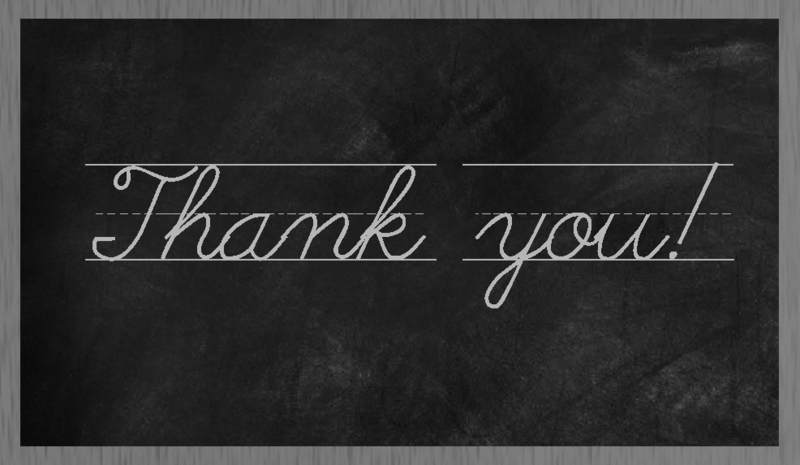 After reviewing various options, Board members decided to ask voters to approve an additional outlay of funds to allow the project to be completed as originally configured, with some changes; the current proposal eliminates the heating and air-conditioning work planned for K.C. Heffernan Elementary School and includes some “value-engineered” (or cost-reducing) modifications that would trim $745,000 off the total project cost. Because the district expects the state to reimburse 81 percent of the project’s cost in building aid, officials estimate the local share of the increase to be $520,292. This means the proposed increase would have zero additional impact on the local tax levy. If the community is not able to support the additional expenditure, the Board will need to make decisions about the how to proceed. Options on the table include starting over, reducing the scope of the project to meet the current approved expenditure or bidding only pieces of the current project and completing what’s possible. The majority of possible scenarios will mean a later start date for the project (2018 or later) and the potential for additional expense to be incurred in the process. The district will hold a public information meeting in October (exact date to be determined). In addition, Superintendent of Schools Michelle Brantner plans to visit several community groups to explain the project and answer questions, and we will be releasing a series of videos describing various facets of the project in the days and weeks ahead. New cost estimates for the Marcellus capital project came in $1.2 million higher than district officials were expecting based on the bids they received last May (plus 3 percent inflation), Superintendent of Schools Michelle Brantner told the Board of Education during its Sept. 6 meeting. In addition, architect Brian Cieslinksi of SEI Design Group recently discovered that an essential digital control package for the heating, ventilation and air-conditioning (HVAC) work planned for K.C. Heffernan Elementary was not included in last May’s request for proposals and subsequent bids. As a result, the associated cost for the controls (about $750,000) was not accounted for in the total project cost. Despite these setbacks, the Board of Education could decide to move forward with the project, minus the HVAC work at KCH (and with the value-engineered modifications previously identified), Ms. Brantner said. The HVAC work could be pushed off for a couple of years, during which time the district would set aside money for the local share of the cost in a capital reserve fund, she said. Board members said they wanted to discuss these new developments further before making a decision. They’ll meet next at 6 p.m. Sept. 12 in the Marcellus High School Learning Commons. At its next regular meeting Sept. 6, the Board of Education will decide how to proceed with the capital project, which was postponed in May after construction bids came in higher than the amount approved by district voters in March 2015. Mr. Cieslinski is one of SEI Design’s four founding members and brings to the Marcellus project more than a quarter-century of professional experience in planning, design and construction of educational facilities. His specialized skill set – including communications, budgeting and job tracking – makes him uniquely suited to helping the district address the issues it now faces with its project, Ms. Brantner told the board. He has a proven track record with guiding districts through challenging project decisions. Mr. Cieslinksi told Board members his next step will be to find a construction management firm to prepare reliable project estimates. At their next meeting on July 5, the Board of Education plans to further discuss the two options presented. As this process continues to unfold, the Board and district administration are committed to keeping community members informed every step of the way. Be sure to check this page regularly. Brian Cieslinski, a senior principal and one of the founding members of architectural firm SEI Design Group, will meet with the Marcellus Board of Education next week, to answer questions and discuss the school district’s options for moving forward with the $14.8 million capital improvement project that was put on hold in May. When bids for construction work came in much higher than the estimates originally provided by SEI Design, the Board of Education had to reject them and delay plans to begin construction and some staff relocations this month. Mr. Cieslinski, who has 25 years of professional experience in planning, design and construction of educational facilities, will now serve as lead architect for the Marcellus project. The Board meets at 6:30 p.m. June 27 in the Marcellus High School Learning Commons. Question: (During the May 31 public meeting, Interim Superintendent Judith Pastel and Board of Education President Ryan Riefler indicated) that the high school needs a secure single point of entry. We already currently have that, with all doors locked during school hours and a security window where visitors must check in. We also have a SRO assigned there. I'm not sure we need to be spending more on new offices in light of the shortfall. As a taxpayer in the district, I'm concerned about "fluff" and want to see instructional areas be the top priority. Answer from Business Administrator Anthony Sonnacchio: The impetus for relocation of office spaces has very little to do with "new" offices and a great deal to do with realignment of instructional spaces. Conversations took place over a roughly 18-month period to determine a configuration suitable for our instructional programs. Summarily, each component is heavily dependent on all others occurring. To answer your question regarding the single point of entry, early discussions regarding office space involved offices remaining where they are now and concerns of unwanted pedestrian traffic between the current main entrance and main office. Over time, our facilities committee decided it was critical to reorient the building to create a STEM (science, technology, engineering and mathematics) wing and humanities wing, to remove (as much as possible) visitor traffic from instructional spaces, and most importantly, to expand the library and create a much-needed life skills classroom. As a result, it was determined that relocation of office spaces was necessary. This decision consequently resulted in a more conventional single point of entry that leads directly into the main office. I'd like to stress that relocation of offices was a consequence of redesign of instructional spaces. During a community meeting attended by some 100 people on May 31, Interim Superintendent Judith Pastel and Board of Education members explained the circumstances that prompted them to temporarily halt plans to begin the district’s $14.8 million capital improvement project. “It’s extremely important that we communicate with our residents with regard to where we are with our capital project and where we go from here,” Dr. Pastel told the crowd gathered in Groeling Auditorium at Marcellus High School. When bids for construction work came in significantly higher – more than $2.5 million higher – than the estimates provided by architectural firm SEI Design, the Board of Education had to “hit the pause button” on plans to begin construction later this month, Dr. Pastel said. In coming weeks, they’ll be reviewing the district’s five options, which the interim superintendent outlined during the public meeting. Reduce the scope of the project. Keep the project design as is and seek new bids in December and January. Ask voters to approve more funding. Use “value engineering” to find places to trim costs. Board members could choose one option or a combination. Administrators continue to investigate what led to the large gap between the costs estimated by the architect and the contractors’ bids, but they believe at least two factors contributed: a long wait for approval of the plan’s designs and specifications from the New York State Department of Education, due to a backlog of requests and an understaffed planning and facilities division; and an upturn in the economy that led to a high demand for contractors. Opening the district’s bids on May 19 was “one of the most frustrating and disappointing” moments of her time as superintendent, Dr. Pastel said. But she had to quickly tamp down her annoyance and spring into action. The Board and superintendent met days later with the district’s attorney and quickly scheduled the community meeting. Several residents stepped up to a microphone to ask questions and voice concerns. Resident Larry Minet asked how much money had been spent on the project so far and if the district has any recourse for recovering that money. “In the end, who’s responsible?” Mr. Minet asked. 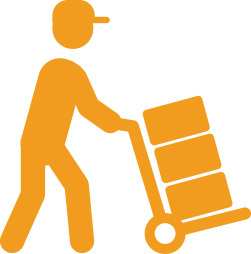 Delaney Moving, which has been assisting the district with packing in preparation for relocating some students and staff during the construction, has agreed to charge Marcellus only for the cost of the moving boxes it provided so far. The clerk of the works trailer will stay where it is in the high school parking lot, because it’s cheaper to pay the $300 monthly rental fee than the $5,000 it would cost to remove it and return it when construction begins. The clerk, who is paid on a per-diem basis, will work only when needed. Who communicated the district’s building needs to the architect? Can the project be re-evaluated to eliminate “fluff”? Much of the scope of the work was determined by needs identified by the district’s state-mandated Building Condition Survey. In addition, the facilities committee identified the high school’s outdated science classrooms – which were left out of a previous capital project about 10 years ago ­– as a priority. Is the Building Condition Survey a public document? Yes, and it’s been posted online here. Can BOCES fill the gap by providing technology instruction to Marcellus students in its facilities? The district needs to do a better job of communicating with the students about what’s happening with the capital project. Although administrators made a point to meet with students in those grades that would be most affected by the planned relocation this past winter, Dr. Pastel agreed that the district should do more now to explain the most recent development to students – and will. Can the district scale back the scope to focus exclusively on academic spaces and cut out planned improvements to offices? Administrators will be digging into every option in coming weeks. Board members noted, however, that the changes to the main office and counseling office were made to accommodate a safer, single point of entry to the school and also make room for humanities classrooms. Is there any way to start earlier than next summer? No. Overall, the construction costs are 24 percent higher than the money the district has available. Therefore, we cannot accept these bids because we don’t have the money. Given how extensive the planned renovations are, construction must begin in the summer months when the buildings are largely empty. Therefore, once a new plan is agreed upon, next summer will be the soonest construction could begin. Is anyone being held accountable for the estimates being too low? “Everyone is being held appropriately accountable,” Dr. Pastel said. For legal reasons, she could not elaborate. What’s the bottom line? How much additional tax would be required for the owner of a $100,000 home to make up the difference? As Board members work to review the district’s options, they’ll get closer to having hard numbers to share. Stay tuned to this space for updates. Is the district still paying to lease the religious education center from St. Francis for district office personnel? No. As soon as the bids came in too high, the district terminated its lease with the church. Please email them to Dr. Pastel at jpastel@marcellusschools.org. We'll be posting questions and answers here as they come in. Because the bids for construction work came in significantly higher than the money earmarked for it in the $14.8 million capital project referendum approved by voters last March, the Marcellus Board of Education now must review its options – all of which include pushing back the project at least one year. Nearly every bid the district received for construction-related work – general contracting, mechanical, electrical, plumbing and site work – came in over the construction costs estimated by the architect, SEI Design Group. Drawings and specifications for the renovation plans – which include overhauling academic spaces, corridors, offices, the main entrance and locker rooms in the high school, and some ventilation and security improvements at K.C. Heffernan Elementary and Driver Middle schools – were submitted to the New York State Education Department for review last fall. The district received SED approval in late March 2016, put out a request for bids in April and opened the bids on May 19. The first hammer swing was expected in late June. Regardless of which path the Board takes, given the nature of the renovations, construction must begin in the summer months when the buildings are largely empty, hence, the one-year postponement. However, because roof work at KCH and the high school already was bid separately and a contract awarded, that work will continue as planned this summer. Board members have scheduled a community meeting for 6:30 p.m. Tuesday, May 31, in the DMS cafeteria, to discuss the status of the project and outline the district’s options. Students will not be relocating at this time as originally planned. On Feb. 1, the Marcellus Board of Education held a special meeting to discuss issues related to the district’s capital project phasing – specifically, the relocation of students it will require during the 2016-17 and 2017-18 school years. Nearly 50 community members, including parents and staff, attended the meeting. Background: Unlike with a renovation project in the private sector, in which construction plans are drafted before financing is secured, school districts have to find the money first – by seeking voter approval with a referendum. After Marcellus residents approved the capital project last March, the district’s architects were able to prepare the project’s plans and specifications, which then were submitted to the New York State Education Department in September. The process continued to unfold throughout the fall, as the facilities committee – composed of board members, administrators, teachers, community members, architects, engineers and the clerk of the works – worked on phasing, or establishing the sequence in which various projects would be completed. Options: Administrators have narrowed the possibilities down to two, both of which keep grades 11-12 at the high school: 1) Grades 6-10 at DMS; 4-5 at the former Kasson Road Elementary (still owned by the district); and K-3 at KCH; or 2) Grades 5-10 at DMS; K-4 at KCH; and district administration at the St. Francis Religious Education Building, which the district would lease. Administrators will continue to study the merits of both scenarios, and Dr. Pastel will render a final decision by March 8. Between now and then, the superintendent said she encourages anyone with additional questions or concerns about the relocation to email her or individual board members. Q: Was the cost of relocating students factored into the project’s overall budget? A: Yes. Included in the project’s 25 percent allocation for incidental costs is $300,000- $400,000 for relocation of people, furniture and supplies, Business Administrator Anthony Sonnacchio explained. Will the relocation affect class size, staffing or the quality of instruction? No. There will be no reduction in FTE as a result of the capital project, or there are no plans to squeeze more students into fewer classrooms. The quality of the district's educational program will remain constant, as dictated by the guiding principles listed above. Is incoming Superintendent of Schools Michelle Brantner aware of the relocation issue? Yes. Dr. Pastel and Mrs. Brantner have begun bi-weekly meetings, and this is one of the topics they will discuss each time. Will students in grades 9-10 have to travel from DMS to SHS for accelerated course work or other specialized instruction? Yes, but the class schedules will be created with them in mind, so students can avoid multiple trips between buildings and maximize the value of those trips. Will the bell schedule for students in grades 9-10 and 11-12 be the same? Yes. Actually, administrators expect grades 7 through 12 to all have the same bell schedule. And, to accommodate having both elementary and secondary schedules under one roof (DMS), the district might need to increase the amount of time students are given to move between classes, which could necessitate extending the length of the school day by as much as 10 minutes. If Marcellus opts to locate students in grades 4-5 at Kasson Road, will they be sharing the building with students from other districts? No. If Kasson Road is part of the relocation plan, the district would not lease space there for use by any other programs. Why didn’t the district consider using portable classrooms outside the high school? It did. In fact, the use of portables was the first option administrators considered and ultimately rejected because of cost, safety and weather concerns. Marcellus would need 12 portable classrooms, at an estimated cost of $750,000, to create the necessary swing space at the high school. The portable scenario would also require students to spend most of the school day shuttling between them in a parking lot, an impractical plan in light of Central New York’s harsh winters. Also, ensuring the safety and security of a school building and 12 portable classrooms – by keeping students on campus and unwelcome strangers off – would not be feasible for the school resource officer. Have other school districts had to relocate children during renovations? Yes. Mrs. Brantner, Dr. Pastel and several other administrators have experience with renovation-related relocations. Every district has different needs during capital projects. Marcellus to fortunate to have an extra elementary building at its disposal, as well as room at DMS and KCH. Middle school and high school students abide by separate sets of rules, i.e. high school students may carry backpacks to classes, whereas their middle school counterparts may not. Will students in grades 9 and 10 be treated as high-schoolers even though they’re based at DMS? Yes. In fact, Principal John Durkee and Dr. Pastel planned to meet with ninth-graders to make sure they’re aware of these and others concerns they might have and plan accordingly. There’s been plenty of behind-the-scenes activity in the five months since district residents approved a $14.85 million capital improvement proposal to upgrade Marcellus Central Schools for 21st century educational programming. The facilities committee held “user group” meetings in April and June with all staff members whose areas will be affected by the project. Because the work includes a complete renovation of all classroom spaces and corridors at Marcellus High School, the meetings involved teachers whose classrooms will be upgraded, as well as maintenance and office staff. The committee also sought input from the transportation department because construction will include a reconfiguration of bus parking areas at the high school. Architects with SEI Design Group used the information gleaned from the user group meetings to prepare the plans and specifications to be submitted to the New York State Education Department by Sept. 15, district Business Administrator Anthony Sonnacchio said. State approval of the project is expected to take about six months. Click on the image above (or on this link) to view artist renderings of some of the improvements planned for Marcellus High School. Met with district Technology Director Elena Drescher, to discuss technology infrastructure. “Each discipline has unique technology needs,” Mr. Sonnacchio said. Met with high school Principal John Durkee, to begin discussions about “phasing,” or the overall construction timeline of the project. Once state approval is granted – the committee hopes by March – the district will seek bids from general, electrical, plumbing and heating, ventilation and air-conditioning (HVAC) contractors. It is anticipated that the Board of Education will accept bids by May, with the project’s first hammer swing expected in the summer of 2016. In addition to renovations in the high school’s academic spaces, the project includes partial roof replacement, relocation of office spaces and the main entrance, renovated locker rooms and a new choral room. It also includes security enhancements at Driver Middle School and K.C. Heffernan Elementary School, along with heating and ventilation unit replacements, and new roofing over the kindergarten wing at KCH. On March 10, Marcellus Central School District residents approved a $14.85 million proposal to upgrade the high school for 21st century educational programming and undertake additional enhancements at C.S. Driver Middle School and K.C. Heffernan Elementary School. Voters approved the capital project proposal 801 votes to 559 votes. The project, scaled down from an earlier proposal rejected by Marcellus voters last October, includes a complete renovation of all classroom spaces and corridors at Marcellus High School, as well as partial roof replacement, relocation of the main office and main entrance, renovated locker rooms and a new choral room. Tailored to reflect community feedback after the first vote, the project includes security enhancements at Driver Middle School and K.C. Heffernan Elementary School, along with heating and ventilation unit replacements and new roofing over the kindergarten wing at KCH. Nearly all of the proposed work qualifies for state aid, significantly decreasing the local share by 42 percent from $57 (as originally proposed) to $33 for the owner of a $100,000 home. Many of the improvements listed in the proposal were identified as priorities in the district’s required Building Condition Survey, including new water pumps and pipes, the removal of asbestos and lead-based paint, the painting of exterior wood fascia and new unit ventilators at KCH. Next steps in the process are: Phase 1 design and development (now through May 2015); New York State Department of Education review and approval (May to June 2015); bidding (May to July 2015); and construction (June to October 2015). Phase 2 construction would occur between March 2016 and February 2017. Click here to read previous news articles about the proposed capital project.